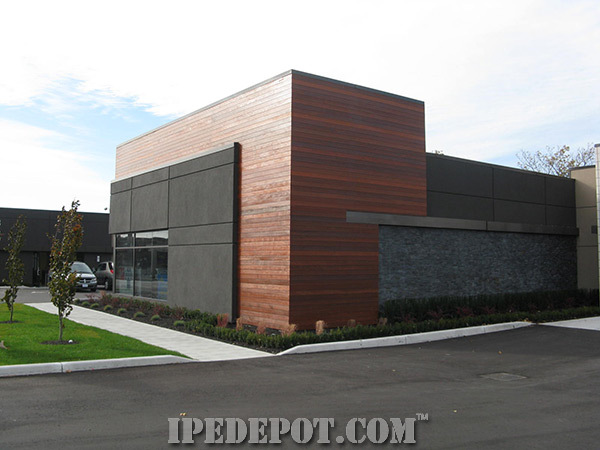 Ipe siding is the best wood siding option available. 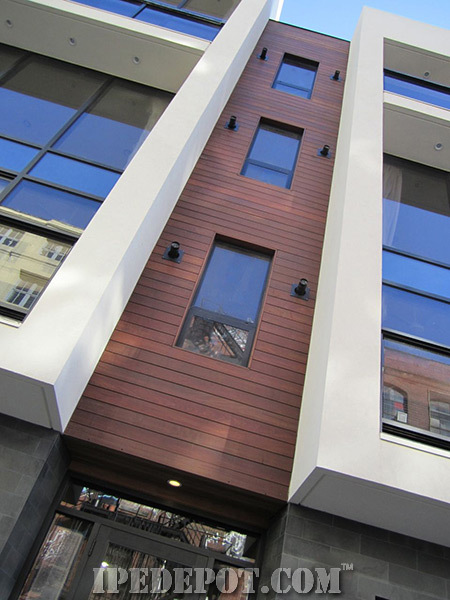 Featured in many commercial and upscale residential projects, siding made of ipe has the same great durable characteristics of standard Ipe Decking. 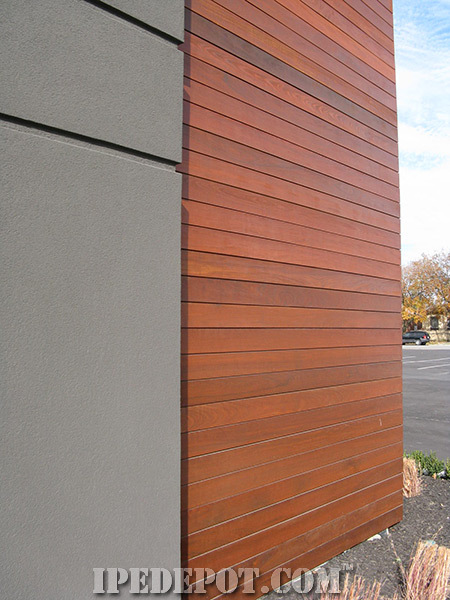 Buildings that use Ipe Siding will maintain their strength even in harshest environmental conditions. 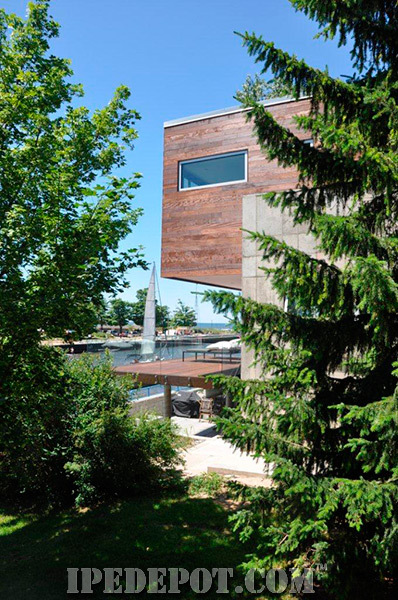 When you compare Ipe wood siding to other artificial siding options, you’ll quickly see why ipe is a superior choice. 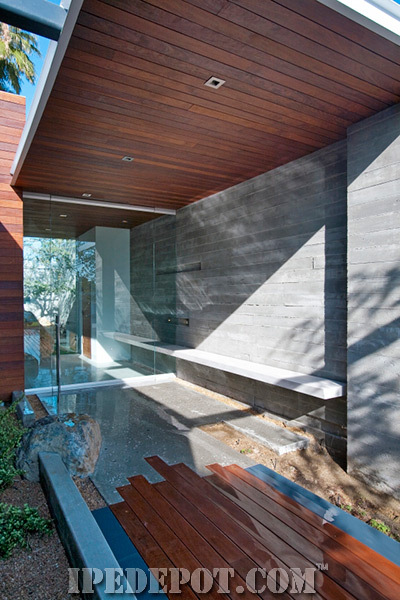 Ipe is 100% natural, maintenance free, and does not have chemically produced additives. 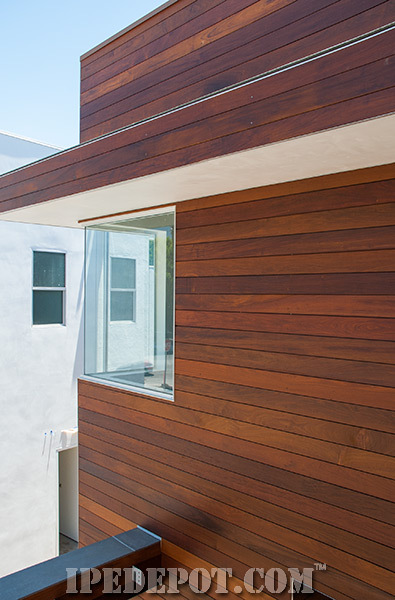 Unlike other siding options, ipe wood siding also easily resists termites, mold, and wood rot. 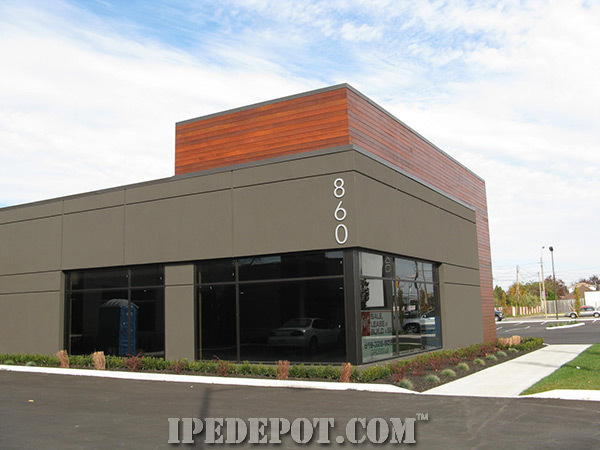 When you order ipe siding with Ipe Depot™, you're buying direct from the mill at a cost not found anywhere else. We have such great siding prices due to our direct relationships with hardwood exporters and the fact that we are the leading supplier of ipe wood in the United States. End grain view to show how the siding fits on eachother. Starting at the bottom start the installation of siding by pre-drilling holes above each furring strip with a 1/8" drill bit. If using Ipe Plugs use a 3/8" drill bit to make a hole for each wood plug to fit into. To secure the bottom half of each board, drive a 3" stainless steel screw through the 1/8" pre-drilled hole. Predrill with a 1/8" drill bit a hole through the narrow part of the siding that sticks out against the wall at the top of the board. Next, drive a 3" stainless steel screw through the 1/8" pre-drilled hole. Do not worry about plugging this hole since the next board you install will cover this fastener. Repeat steps 1-6 the above steps for the rest of the project. This is only an example of the siding profiles that we offer. Please contact us for more info. We can accommodate almost any specifications that you may need. 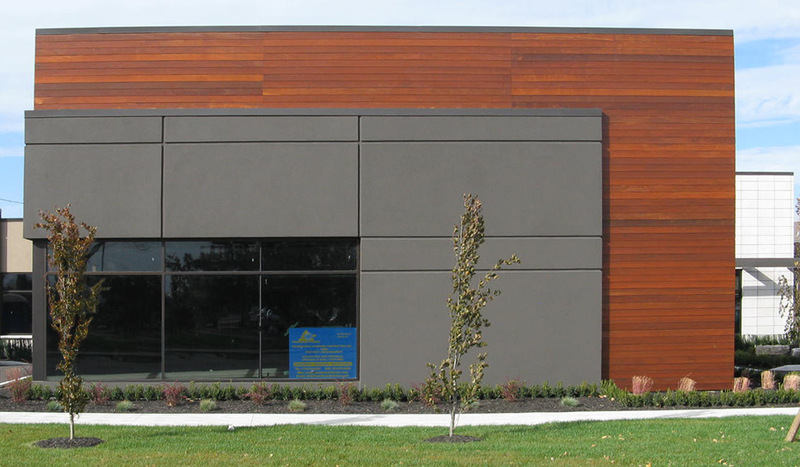 Ipe Rainscreen Siding is both long lasting & beautiful. End grain view to show how Ipe Rainscreen Siding fits on eachother. Calculate how much siding you will need based on the "Net Finished Dimensions" only. Advantage Rainscreen Siding must acclimate to your local climate. Use Advantage End Seal to cover the ends of the grain of any freshly cut siding boards. Do you need a permit? Permission from your Homeowner's Association? Before starting any project, you must always check local building codes. Install the baseboard (horizontal furring strip) with stainless screws. Ensure the baseboard is level. Align furring strips vertically on top of baseboard 16" on center. Attach furring strips. 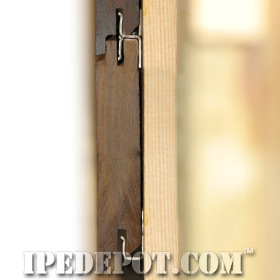 Install starter clips (included with the hidden siding fastener kit) on your baseboard. Align each starter clip with the furring strips installed in step 3. (TIP: use a chalk line reel to create a level line). 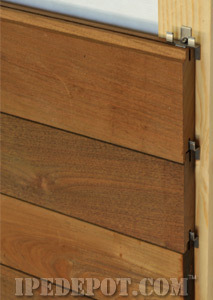 Install the first Advantage Rainscreen Siding board on top of the starter clips. (TIP: Use a level to ensure this first board is aligned properly). Drive stainless steel screw through the siding fastener into the furring strip at a 45 degree angle. Set the proceeding siding boards on top of the installed siding fasteners. (TIP: Use a rubber mallet to align boards properly). TIP: Where two pieces of siding abut against each other, use two fasteners. (Use two starter clips if there is more than one piece of siding installed on the baseboard). 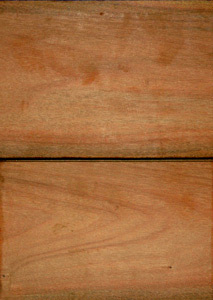 Looking For Additional Information on Ipe Products?? ?